In the UAE specifically, fortifying foods with vitamin D is helping to curb a plethora of ailments, from neurogenerative diseases and cardiovascular disorders to pregnancy-related disorders and autoimmune diseases. 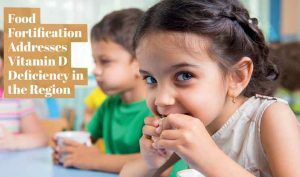 Andreas Bluethner, Director Food-Fortification, BASF tells how food fortification can reduce vitamin and mineral deficiency for at-risk individuals. Although vitamin D can be produced by human skin upon exposure to sunlight, and there is plenty of sunshine all year round, there is a high prevalence of vitamin D insufficiency in the Middle East. Clothing, shielding, skin pigmentation, sun protection measures, and lack of outdoor activity all play a role and inhibit sufficient vitamin D production in the skin. Dietary intake of vitamin D is also not sufficient due to the lack of vitamin D in most foods. Vitamin D is found in only a few foods such as fatty fish, and tiny amounts are found in butter and eggs. Not even a healthy diet makes it possible to consume enough vitamin D to meet the required amounts. Vitamin D is the precursor of an important hormone that impacts the function of the entire human body. For example, it regulates bone mineralization since it allows calcium flux into bone tissue. In children, a deficiency of vitamin D leads to bone deformation, a disease called “rickets”. In the Middle East, rates of rickets in children are among the highest in the world (International Osteoporosis Foundation, 2018). In adults, vitamin D deficiency causes weakening of the bones over time, referred to as “osteomalacia” and increased risk of fractures in elderly people is the consequence. Beyond bone health, vitamin D is important for heart and vascular health, where it regulates heart function. Epidemiological studies indicate an inverse relationship between vitamin D status and obesity. Pre-clinical studies have shown that vitamin D has an impact on body fat tissue and point to at least a partially-causal role of vitamin D insufficiency in obesity and associated disorders such as adipose tissue inflammation and subsequent insulin resistance. While clinical and genetic studies show diverse results ruling out solid conclusions for the moment, nevertheless, prospective studies provide interesting data supporting the hypothesis of a preventive role of vitamin D in the onset of obesity. It is important to note that obesity is often connected with micronutrient deficiencies since calorie-dense foods and beverages do not necessarily carry essential nutrients that the body needs. One can be obese while nutrient deficient, a phenomenon described as the ‘double-burden of malnutrition’. Fortification can help reduce one side of the burden, namely the nutrition deficiency.